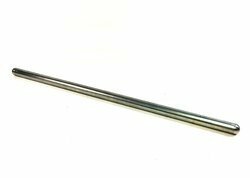 High quality Tamping Rod can be availed from us. Tamping Bar made of steel This is 40 cm long, having a ramming face of 25 mm square Other end has a grip. Weight approximate 2 kg. This tamping tool is used in various industries. Closed die forged Tamping tools for use on CSM / Duomatic / Tamping express 3X machines, duly brazed with tungsten carbide, strictly as per RDSO specification and drawings. The pace our company has acquired in this challenging industry is owing to our ability of manufacturing, exporting and supplying an accurately designed range of Tamping Tools. With the persistent endeavor and support of our team, we are capable of developing products according to the actual requirements of our valued clients. This is used for compacting concrete into cube moulds. This rod is made of steel it is 16mm dia., 600mm in length and rounded at both ends. Prema Engineering Works is engaged in manufacturing and supplying Industrial Sheet Metal Components, Transformer Components, Industrial Counterweight, Elevator Cabins and Industrial Brackets. We also offer Sheet Metal Fabrication Services. It is used for tamping aggregates during conducting aggregate crushing value test. Size : 16 mm Dia x 450 mm Long. Rounded at one end and other end in bullet shape. Our Company provides a wide range of cost effective, steel made Tamping Bar. It has a length of 40cm and has ramming face of 25mm sp. Its other end has a grip, which makes it solid. It weighs around 2 kgs.